URGENT MODELS needed for Sensual romantic R&B music video. Our client is a brand new upcoming singer / songwriter, who is looking to take his music video’s to a another level. 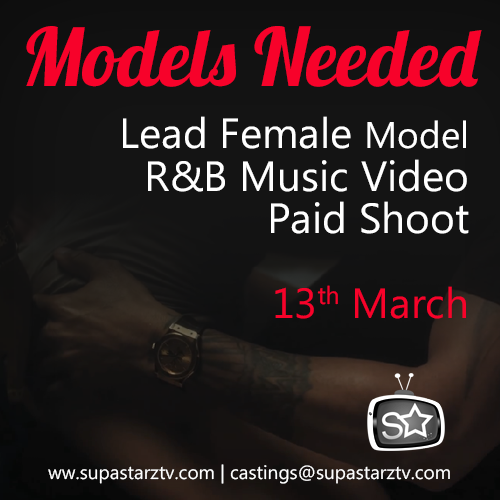 Seeking an open-minded female for a lead role in a sexual yet classy grown R&B Music video. The scenes required is very sensual be approached and filmed in a tasteful manner. The female would need to be able to play the role of a confident dominating believable girlfriend. Who is bursting with passion. The shoot will be in a penthouse/apartment and you will be required for up to 4 hours. The video is for an upcoming UK R&B artist with major exposure guaranteed. More in depth details will be provided upon application. Please only apply if you are available, This Friday the 13th march.